Pink MagaLine: What's your favorite brand of flip-flops? In a tropical country like Philippines, one should be wearing flip-flops or slippers most of the time. I remember the Nikon slippers for girls and Rambo slippers for boys when I was in grade school. In college, they were replaced with alpombra and Islander. 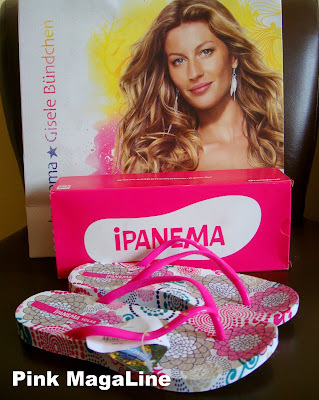 Because of globalization, more choices came like Havaianas, Crocs and iPanema. Now for the question about which brand do I consider my favorite, it is honestly iPanema. I bought my first pair last year for our Palawan trip. I chanced on a brown and white combination which was that time 40% off the regular price at Robinson's Pioneer. I didn't buy a new pair after that because they're still in a very good condition. 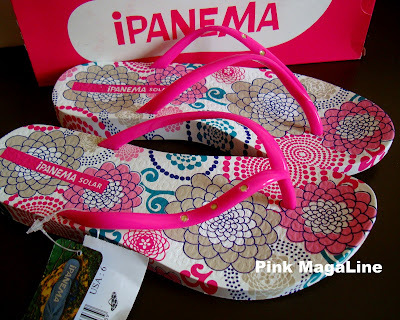 Last week, I decided to finally get a new pair of iPanema flip-flops. This time, I bought it from Bambu in Glorietta Makati. There in that outlet, they have a huge selection of slippers and sandals of unique designs and colors. I had a crush on 3 different pink slippers but I ended up buying this floral and studded one. 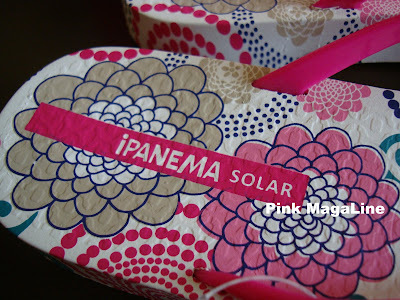 This design is called iPanema SOLAR. I had my pair in size 6 just perfect for my 2 week vacation to the province this week. Will post photos of me wearing them next time. See ya! cute and pink! They look heavy. Are they? Those are super cute and girly! I love them! I buy Fitflops. I already have four pairs which I all find to be very comfortable.